At Mill Close Farm, our butchers produce many burgers and sausages for our customers each morning. Our butchers start at 4am, meaning that a sausage or burger can be hand produced and hand delivered to your restaurant on the same day. We are very proud of our award-winning beef burger recipe, it’s a perfect blend of flavor and taste. The burgers can either be pressed, or hand formed for a thicker and more rustic appearance. Our burgers are perfect for BBQs in the summer, where they offer a consistent robustness to grilling, meaning that they never crumble. Alternatively, many restaurants use our burgers within their menu throughout the year. 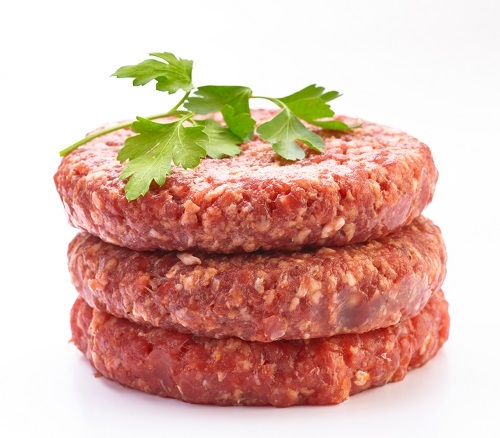 A great deal of customer opinion can be placed on the taste of a restaurant’s burger, and by using Yorkshire Dales Meat Company to produce yours, you can rest assured that your menu contains a burger you can be proud of. Our expert butchers produce a variety of sausages, and they are enjoyed by diners during breakfast, lunch and evening meals. Our farmhouse breakfast sausages offer diners a succulent start to the day, whilst our specialty sausages, for example our wild boar sausage can offer a premium aspect to your menu. Please see below for a brief overview of the Burgers and Sausages we offer. We can produce to spec, and also have a wide variety of products which aren’t listed. Please get in touch with us to discuss your needs.